"Naval" and "Naval Force" redirect here. For other uses of "Naval", see Naval (disambiguation). For other uses of "Navy", see Navy (disambiguation). A flotilla from the Indian Navy's Western Fleet escorts the aircraft carriers INS Viraat and INS Vikramaditya through the Arabian Sea in 2014. A navy or maritime force is the branch of a nation's armed forces principally designated for naval and amphibious warfare; namely, lake-borne, riverine, littoral, or ocean-borne combat operations and related functions. It includes anything conducted by surface ships, amphibious ships, submarines, and seaborne aviation, as well as ancillary support, communications, training, and other fields. The strategic offensive role of a navy is projection of force into areas beyond a country's shores (for example, to protect sea-lanes, deter or confront pirates, ferry troops, or attack other navies, ports, or shore installations). The strategic defensive purpose of a navy is to frustrate seaborne projection-of-force by enemies. The strategic task of the navy also may incorporate nuclear deterrence by use of submarine-launched ballistic missiles. 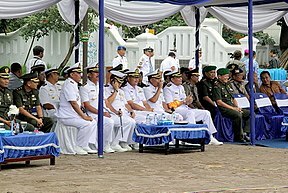 Naval operations can be broadly divided between riverine and littoral applications (brown-water navy), open-ocean applications (blue-water navy), and something in between (green-water navy), although these distinctions are more about strategic scope than tactical or operational division. In most nations, the term "naval", as opposed to "navy", is interpreted as encompassing all maritime military forces, e.g., navy, naval infantry/marine corps, and coast guard forces. The word formerly denoted fleets of both commercial and military nature. In modern usage "navy" used alone always denotes a military fleet, although the term "merchant navy" for a commercial fleet still incorporates the non-military word sense. This overlap in word senses between commercial and military fleets grew out of the inherently dual-use nature of fleets; centuries ago, nationality was a trait that unified a fleet across both civilian and military uses. Although nationality of commercial vessels has little importance in peacetime trade other than for tax avoidance, it can have greater meaning during wartime, when supply chains become matters of patriotic attack and defense, and when in some cases private vessels are even temporarily converted to military vessels. The latter was especially important, and common, before 20th-century military technology existed, when merely adding artillery and naval infantry to any sailing vessel could render it fully as martial as any military-owned vessel. Such privateering has been rendered obsolete in blue-water strategy since modern missile and aircraft systems grew to leapfrog over artillery and infantry in many respects; but privateering nevertheless remains potentially relevant in littoral warfare of a limited and asymmetric nature. HMS Victory, the oldest warship still in commission in the world. Naval warfare developed when humans first fought from water-borne vessels. Prior to the introduction of the cannon and ships with sufficient capacity to carry the large guns, navy warfare primarily involved ramming and boarding actions. In the time of ancient Greece and the Roman Empire, naval warfare centered on long, narrow vessels powered by banks of oarsmen (such as triremes and quinqueremes) designed to ram and sink enemy vessels or come alongside the enemy vessel so its occupants could be attacked hand-to-hand. Naval warfare continued in this vein through the Middle Ages until the cannon became commonplace and capable of being reloaded quickly enough to be reused in the same battle. The Chola Dynasty of medieval India was known as one of the greatest naval powers of its time from 300 BC to 1279 AD. The Chola Navy, Chola kadarpadai comprised the naval forces of the Chola Empire along with several other Naval-arms of the country. The Chola navy played a vital role in the expansion of the Chola Tamil kingdom, including the conquest of the Sri Lanka islands, Kadaaram (Present day Burma), Sri Vijaya (present day Southeast Asia), the spread of Hinduism, Tamil architecture and Tamil culture to Southeast Asia and in curbing the piracy in Southeast Asia in 900 CE. In ancient China, large naval battles were known since the Qin dynasty (also see Battle of Red Cliffs, 208), employing the war junk during the Han dynasty. However, China's first official standing navy was not established until the Southern Song dynasty in the 12th century, a time when gunpowder was a revolutionary new application to warfare. Nusantaran thalassocracies made extensive use of naval power and technologies. This enabled the seafaring Malay people to attack as far as the coast of Tanganyika and Mozambique with 1000 boats and attempted to take the citadel of Qanbaloh, about 7,000 km to their West, in 945-946 AD. In 1350 AD Majapahit launched its largest military expedition, the invasion of Pasai, with 400 large jong and innumerable smaller vessels. The second largest military expedition, invasion of Singapura in 1398, Majapahit deployed 300 jong with no less than 200,000 men. The mass and deck space required to carry a large number of cannon made oar-based propulsion impossible, and ships came to rely primarily on sails. Warships were designed to carry increasing numbers of cannon and naval tactics evolved to bring a ship's firepower to bear in a broadside, with ships-of-the-line arranged in a line of battle. The development of large capacity, sail-powered ships carrying cannon led to a rapid expansion of European navies, especially the Spanish and Portuguese navies which dominated in the 16th and early 17th centuries, and helped propel the age of exploration and colonialism. The repulsion of the Spanish Armada (1588) by the English fleet revolutionized naval warfare by the success of a guns-only strategy and caused a major overhaul of the Spanish Navy, partly along English lines, which resulted in even greater dominance by the Spanish. From the beginning of the 17th century the Dutch cannibalized the Portuguese Empire in the East and, with the immense wealth gained, challenged Spanish hegemony at sea. From the 1620s, Dutch raiders seriously troubled Spanish shipping and, after a number of battles which went both ways, the Dutch Navy finally broke the long dominance of the Spanish Navy in the Battle of the Downs (1639). 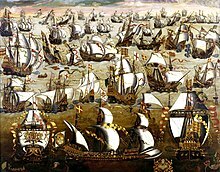 England emerged as a major naval power in the mid-17th century in the first Anglo-Dutch war with a technical victory. 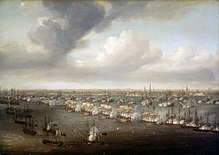 Successive decisive Dutch victories in the second and third Anglo-Dutch Wars confirmed the Dutch mastery of the seas during the Dutch Golden Age, financed by the expansion of the Dutch Empire. The French Navy won some important victories near the end of the 17th century but a focus upon land forces led to the French Navy's relative neglect, which allowed the Royal Navy to emerge with an ever-growing advantage in size and quality, especially in tactics and experience, from 1695. As a response to growing naval influence of the navies of Portuguese, the warrior king of the Marathas, Chhatrapati Shivaji Maharaj laid the foundation of the Maratha navy in 1654. Throughout the 18th century the Royal Navy gradually gained ascendancy over the French Navy, with victories in the War of Spanish Succession (1701–1714), inconclusive battles in the War of Austrian Succession (1740–1748), victories in the Seven Years' War (1754–1763), a partial reversal during the American War of Independence (1775–1783), and consolidation into uncontested supremacy during the 19th century from the Battle of Trafalgar in 1805. These conflicts saw the development and refinement of tactics which came to be called the line of battle. The next stage in the evolution of naval warfare was the introduction of metal plating along the hull sides. The increased mass required steam-powered engines, resulting in an arms race between armor and weapon thickness and firepower. 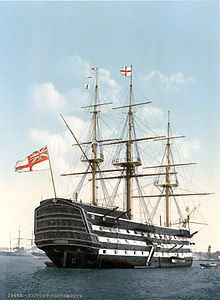 The first armored vessels, the French Gloire and British HMS Warrior, made wooden vessels obsolete. Another significant improvement came with the invention of the rotating turrets, which allowed the guns to be aimed independently of ship movement. The battle between CSS Virginia and USS Monitor during the American Civil War (1861–1865) is often cited as the beginning of this age of maritime conflict. The Russian Navy was considered the third strongest in the world on the eve of the Russo-Japanese War, which turned to be a catastrophe for the Russian military in general and the Russian Navy in particular. Although neither party lacked courage, the Russians were defeated by the Japanese in the Battle of Port Arthur, which was the first time in warfare that mines were used for offensive purposes. The warships of the Baltic Fleet sent to the Far East were lost in the Battle of Tsushima. A further step change in naval firepower occurred when the United Kingdom launched HMS Dreadnought in 1906, but naval tactics still emphasized the line of battle. The first practical military submarines were developed in the late 19th century and by the end of World War I had proven to be a powerful arm of naval warfare. During World War II, Nazi Germany's submarine fleet of U-boats almost starved the United Kingdom into submission and inflicted tremendous losses on U.S. coastal shipping. The German battleship Tirpitz, a sister ship of Bismarck, was almost put out of action by miniature submarines known as X-Craft. The X-Craft severely damaged her and kept her in port for some months. 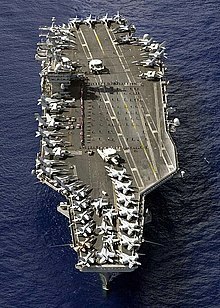 A major paradigm shift in naval warfare occurred with the introduction of the aircraft carrier. First at Taranto in 1940 and then at Pearl Harbor in 1941, the carrier demonstrated its ability to strike decisively at enemy ships out of sight and range of surface vessels. The Battle of Leyte Gulf (1944) was arguably the largest naval battle in history; it was also the last battle in which battleships played a significant role. By the end of World War II, the carrier had become the dominant force of naval warfare. World War II also saw the United States become by far the largest Naval power in the world. In the late 20th and early 21st centuries, the United States Navy possessed over 70% of the world's total numbers and total tonnage of naval vessels of 1,000 tons or greater. Throughout the rest of the 20th century, the United States Navy would maintain a tonnage greater than that of the next 17 largest navies combined. During the Cold War, the Soviet Navy became a significant armed force, with large numbers of large, heavily armed ballistic missile submarines and extensive use of heavy, long-ranged antisurface missiles to counter the numerous United States carrier battle groups. Only three nations (United States, France, and Brazil) presently operate CATOBAR carriers of any size, while Russia, China and India operate sizeable STOBAR carriers (although all three are originally of Russian design). The United Kingdom is also currently constructing two Queen Elizabeth-class carriers, which will be the largest STOVL vessels in service, and India is currently building one aircraft carrier, INS Vikrant, and considering another. France is also looking at a new carrier, probably using a CATOBAR system and possibly based on the British Queen Elizabeth design. 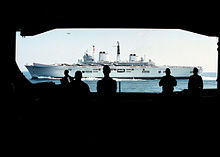 HMS Invincible sails towards the Falkland Islands during the Falklands War of 1982. The Falklands War was the largest naval conflict since World War II. 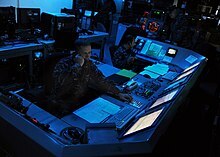 US Navy officers aboard the aircraft carrier USS Abraham Lincoln monitor defense systems during maritime security operations. Navies may conduct military operations other than war. A navy typically operates from one or more naval bases. The base is a port that is specialized in naval operations, and often includes housing, a munitions depot, docks for the vessels, and various repair facilities. During times of war temporary bases may be constructed in closer proximity to strategic locations, as it is advantageous in terms of patrols and station-keeping. Nations with historically strong naval forces have found it advantageous to obtain basing rights in other countries in areas of strategic interest. Navy ships can operate independently or with a group, which may be a small squadron of comparable ships, or a larger naval fleet of various specialized ships. The commander of a fleet travels in the flagship, which is usually the most powerful vessel in the group. Prior to the invention of radio, commands from the flagship were communicated by means of flags. At night signal lamps could be used for a similar purpose. Later these were replaced by the radio transmitter, or the flashing light when radio silence was needed. A "blue water navy" is designed to operate far from the coastal waters of its home nation. These are ships capable of maintaining station for long periods of time in deep ocean, and will have a long logistical tail for their support. Many are also nuclear powered to save having to refuel. By contrast a "brown water navy" operates in the coastal periphery and along inland waterways, where larger ocean-going naval vessels can not readily enter. Regional powers may maintain a "green water navy" as a means of localized force projection. Blue water fleets may require specialized vessels, such as minesweepers, when operating in the littoral regions along the coast. A basic tradition is that all ships commissioned in a navy are referred to as ships rather than vessels, with the exception of destroyers and submarines, which are known as boats. The prefix on a ship's name indicates that it is a commissioned ship. 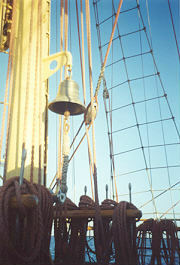 An important tradition on board naval vessels of some nations has been the ship's bell. This was historically used to mark the passage of time, as warning devices in heavy fog, and for alarms and ceremonies. The ship's captain, and more senior officers are "piped" aboard the ship using a Boatswain's call. In the United States, the First Navy Jack is a flag that has the words, "Don't Tread on Me" on the flag. By English tradition, ships have been referred to as a "she". However, it was long considered bad luck to permit women to sail on board naval vessels. To do so would invite a terrible storm that would wreck the ship. The only women that were welcomed on board were figureheads mounted on the prow of the ship. Firing a cannon salute partially disarms the ship, so firing a cannon for no combat reason showed respect and trust. As the tradition evolved, the number of cannon fired became an indication of the rank of the official being saluted. 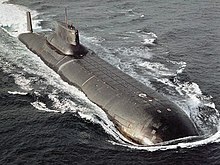 Typhoon-class submarines are the largest submarines ever built. Historically, navy ships were primarily intended for warfare. They were designed to withstand damage and to inflict the same, but only carried munitions and supplies for the voyage (rather than merchant cargo). Often, other ships which were not built specifically for warfare, such as the galleon or the armed merchant ships in World War II, did carry armaments. In more recent times, navy ships have become more specialized and have included supply ships, troop transports, repair ships, oil tankers and other logistics support ships as well as combat ships. Modern navy combat ships are generally divided into seven main categories: aircraft carriers, cruisers, destroyers, frigates, corvettes, submarines, and amphibious assault ships. There are also support and auxiliary ships, including the oiler, minesweeper, patrol boat, hydrographic and oceanographic survey ship and tender. During the age of sail, the ship categories were divided into the ship of the line, frigate, and sloop-of-war. Naval ship names are typically prefixed by an abbreviation indicating the national navy in which they serve. For a list of the prefixes used with ship names (HMS, USS, LÉ, etc.) see ship prefix. Today ships are significantly faster than in former times, thanks to much improved propulsion systems. Also, the efficiency of the engines has improved, in terms of fuel, and of how many sailors it takes to operate them. In World War II, ships needed to refuel very often. However, today ships can go on very long journeys without refueling. Also, in World War II, the engine room needed about a dozen sailors to work the many engines, however, today, only about 4–5 are needed (depending on the class of the ship). Today, naval strike groups on longer missions are always followed by a range of support and replenishment ships supplying them with anything from fuel and munitions, to medical treatment and postal services. This allows strike groups and combat ships to remain at sea for several months at a time. Navies use many types of boat, ranging from 9-foot (2.7 m) dinghies to 135-foot (41 m) landing craft. They are powered by either diesel engines, out-board gasoline engines, or waterjets. Most boats are built of aluminum, fiberglass, or steel. Rigid-hulled inflatable boats are also used. Patrol boats are used for patrols of coastal areas, lakes and large rivers. Soviet PT-76 light amphibious tank moves down the ramp of an Aist-class hovercraft. Landing craft are designed to carry troops, vehicles, or cargo from ship to shore under combat conditions, to unload, to withdraw from the beach, and to return to the ship. They are rugged, with powerful engines, and usually armed. There are many types in today's navies including hovercraft. They will typically have a power-operated bow ramp, a cargo well and after structures that house engine rooms, pilot houses, and stowage compartments. These boats are sometimes carried by larger ships. Special operations craft are high-speed craft used for insertion and extraction of special forces personnel and some may be transportable (and deployed) by air. Boats used in non-combat roles include lifeboats, mail boats, line handling boats, buoy boats, aircraft rescue boats, torpedo retrievers, explosive ordnance disposal craft, utility boats, dive boats, targets, and work boats. 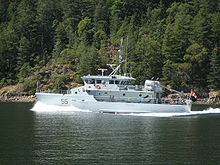 Boats are also used for survey work, tending divers, and minesweeping operations. Boats for carrying cargo and personnel are sometimes known as launches, gigs, barges or shore party boats. Naval forces are typically arranged into units based on the number of ships included, a single ship being the smallest operational unit. Ships may be combined into squadrons or flotillas, which may be formed into fleets. The largest unit size may be the whole Navy or Admiralty. A task force can be assembled using ships from different fleets for an operational task. Despite their acceptance in many areas of naval service, female sailors were not permitted to serve on board U.S. submarines until the U.S. Navy lifted the ban in April 2010. The major reasons historically cited by the U.S. Navy were the extended duty tours and close conditions which afford almost no privacy. The United Kingdom's Royal Navy has had similar restrictions. Australia, Canada, Norway, and Spain previously opened submarine service to women sailors. Newly commissioned officers celebrate their new positions by throwing their midshipmen covers into the air as part of a U.S. Naval Academy graduation and commissioning ceremony. A navy will typically have two sets of ranks, one for enlisted personnel and one for officers. "Flag officers" include any rank that includes the word "admiral" (or commodore in services other than the US Navy), and are generally in command of a battle group, strike group or similar flotilla of ships, rather than a single ship or aspect of a ship. However, commodores can also be temporary or honorary positions. For example, during World War II, a Navy captain was assigned duty as a convoy commodore, which meant that he was still a captain, but in charge of all the merchant vessels in the convoy. The most senior rank employed by a navy will tend to vary depending on the size of the navy and whether it is wartime or peacetime, for example, few people have ever held the rank of Fleet Admiral in the U.S. Navy, the chief of the Royal Australian Navy holds the rank of Vice Admiral, and the chief of the Irish Naval Service holds the rank of Commodore. Jaubert commandos of the French Navy demonstrating a mock, seaborne assault on the support vessel Alcyon. Naval infantry, commonly known as marines, are a category of infantry that form part of a state's naval forces and perform roles on land and at sea, including amphibious operations, as well as other, naval roles. They also perform other tasks, including land warfare, separate from naval operations. During the era of the Roman empire, naval forces included marine legionaries for maritime boarding actions. These were troops primarily trained in land warfare, and did not need to be skilled at handling a ship. Much later during the age of sail, a component of marines served a similar role, being ship-borne soldiers who were used either during boarding actions, as sharp-shooters, or in raids along shorelines. The Spanish Infantería de Marina was formed in 1537, making it the oldest, current marine force in the world. The British Royal Marines combine being both a ship-based force and also being specially trained in commando-style operations and tactics, operating in some cases separately from the rest of the Royal Navy. The Royal Marines also have their own special forces unit. In the majority of countries, the marine force is an integral part of the navy. The United States Marine Corps is a separate armed service within the United States Department of the Navy, with its own leadership structure. A Sea Harrier on the flight deck of an Indian Navy aircraft carrier in 2007. In World War I several navies used floatplanes and flying boats - mainly for scouting. By World War II, aircraft carriers could carry bomber aircraft capable of attacking naval and land targets, as well as fighter aircraft for defence. Since World War II helicopters have been embarked on smaller ships in roles such as anti-submarine warfare and transport. Some navies have also operated land-based aircraft in roles such as maritime patrol and training. Naval aviation forces primarily perform naval roles at sea. However, they are also used in a variety of other roles. Combat Fleets of the World: Their Ships, Aircraft and Systems - Naval Institute Press. Published annually. Comprehensive. Corbett, Sir Julian, Some Principles of Maritime Strategy, 1911. Mahan, Alfred Thayer, The Influence of Sea Power upon History, 1660-1783, 1918, Little Brown, Boston. Marder, Arthur. The Anatomy of British Seapower. New York: Octagon Books, 1940. Marder, Arthur. "The Influence of History on Sea Power: The Royal Navy and the Lessons of 1914-1918," Pacific Historical Review. November, 1972. Richmond, Herbert. National Policy and National Strength and other Essays. London: Longman, Green and Co., 1928. Sprout, Harold and Margaret Sprout. Toward a New Order of Sea Power: American Naval Policy ... 1918-1922. Princeton: Princeton University Press, 1940. ^ Found on the KN U 736, PY Na 568, PY Vn 865 and PY Xn 990 tablets. Cf. ναυπηγός. ^ Harper, Douglas. "navy". Online Etymology Dictionary. ^ navigium. Charlton T. Lewis and Charles Short. A Latin Dictionary on Perseus Project. ^ navis. Charlton T. Lewis and Charles Short. A Latin Dictionary on Perseus Project. ^ navalis. Charlton T. Lewis and Charles Short. A Latin Dictionary on Perseus Project. ^ ναῦς. Liddell, Henry George; Scott, Robert; A Greek–English Lexicon at the Perseus Project. ^ ναύτης in Liddell and Scott. ^ "The Linear B word na-u-do-mo". Palaeolexicon. Word study tool of ancient languages. ^ Raymoure, K.A. "na-u-do-mo". Minoan Linear A & Mycenaean Linear B. Deaditerranean. ^ "KN 736 U (unknown)". "PY 568 Na (1)". "PY 865 Vn + fr. (Ci)". "PY 990 Xn (unknown)". DĀMOS: Database of Mycenaean at Oslo. University of Oslo. Archived from the original on 2014-03-25. ^ Reid, Anthony (2012). Anthony Reid and the Study of the Southeast Asian Past. Institute of Southeast Asian Studies. ISBN 9814311960. ^ Chronicle of the Kings of Pasai, 3: 98. ^ "NATO Review - Vol. 49 - No 2 - Summer 2001". Look up navy in Wiktionary, the free dictionary. "Navy, The" . Collier's New Encyclopedia. 1921.